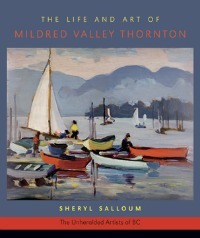 A unique story not to be overlooked, The Life and Art of Mildred Valley Thornton, is the fourth biography in a series of “Unheralded Artists of British Columbia.” Author Sheryl Salloum lovingly portrays Mildred Valley Thornton (1890 to 1967) from her early years in rural Ontario to her unconventional married life in Vancouver. Accompanying the text are several of Thornton’s masterful oil and watercolour paintings as well as family photographs. Thornton’s legacy includes more than 300 portraits, most of First Nations people. She befriended and learned from her subjects and came to advocate on their behalf. Asked why she chose to paint First Nations people over other groups, Thornton simply said she considered them more interesting. Several male aboriginal leaders sat for Thornton, but she also painted aboriginal women and vivid scenes of life on the reserves. Thornton painted quickly, as the author explains, skilfully capturing the spirit of her subjects. She felt an urgency to document what she feared was a disappearing way of life. This notion also compelled Thornton to share her paintings and knowledge of First Nations culture and traditions through writing and speaking engagements. Thornton also painted Canadian landscapes. A few are compared favourably to Group of Seven artist Tom Thomson. Indeed, Thornton was “as Canadian as wheat,” as a contemporary commented. She lived in a time of of domestic conformity for women, yet histories (such as this book) continue to emerge to indicate exceptions. Thornton was supported by her husband, John who shared in the raising of their twin sons Maitland and Jack, born in 1926, freeing her to spend time to paint and travel. Thornton was also involved with the Vancouver literary community after her family moved here from Saskatchewan in 1934 and was an art critic for the Vancouver Sun from 1944 to 1959. Another unconventional woman of the times was Maisie Hurley, with whom Thornton befriended. Hurley began publishing The Native Voice newspaper in 1946 and Thornton was an occasional contributor. A wealth of source materials, detailed in extensive endnotes, allowed the author to successfully trace much of Thornton’s life, from her art school days in the mid-west of the United States to her final days as a widow in Vancouver’s Kerrisdale neighbourhood. Interviews with family members including a son, Jack Thornton, now living in Victoria, and two grandchildren Janet and John Thornton, enrich this story as well. The author explores the reasons acclaim eluded Thornton, garnering viewpoints from members of the art community, past and present. Among her findings, Salloum notes Canadians tend to undervalue portraiture in favour of landscapes. The author also addresses the racial politics of Thornton’s (and others) art work in a sensitive and informed manner and considers its impact on Thornton’s legacy. While in declining health in her final days, Thornton struggled to find an appropriate public space in Canada for her paintings. She didn’t want her collection broken up or sold to private collectors. The outcome of her efforts is yet another compelling story the author reveals in the concluding pages. Ultimately, the value given to Thornton’s work reflects who we are as Canadians as much as it reflects the reputation of this accomplished artist. Watch for my interview with Mona Fertig, Mother Tongue Publishing, in Galleries West magazine, January 2012.